Travel Around the World for 6 Weeks Without Luggage? I thought I was ambitious being able to travel to Europe for two weeks with just a single 6-kilogram carry-on, but it looks like someone’s got me beat by a mile. Travel writer Rolf Potts earlier this year embarked on a six-week, round-the-world journey that took him to 12 countries in 5 continents. Dubbed the “No Baggage Challenge,” the experiment, which was sponsored by multi-pocket jacket manufacturer SCOTTEVEST, was designed specifically to see if it was possible to travel without even a single bag. 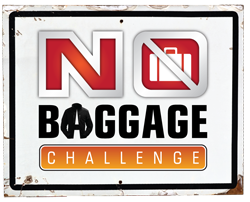 The logo for Rolf Potts' "No Baggage Challenge." His packing list is pretty impressive. I was most curious about his clothes, and for that he pared it down to the bare minimum: an extra T-shirt, two pairs of extra socks, one extra pair of underwear. He took tiny bottles with him for washing his clothes every evening in his room. He kept electronics to a minimum and just took an iPod Touch and a collapsible keyboard. Depending on how much he needed to write, he could’ve probably even done away with the latter. His secret? His ScottEVest Tropical Jacket. A lot of light travelers wear the ScottEVest jackets because of their 20+ pockets, and Rolf was no exception. You can view his blog and video journal entries at his site (link). To find out exactly what he actually carried with him on his trip, go directly to his packing page (link). Congratulations to both Rolf and to his sponsor, SCOTTEVEST, for a successful experiment in ultra-light traveling.